GameStop is gearing up for a huge launch tonight for Activision's latest Call of Duty: Black Ops. Call of Duty: Black Ops releases tomorrow and customers are already lining up to buy it at GameStops around the country. The major U.S. retailer is preparing for midnight launches of Black Ops at 4,400 of its stores, which is roughly 98 percent of GameStops in the U.S. In fact, more GameStop stores are holding midnight events for Black Ops than it has for any other videogame title, according to senior VP of merchandising Bob McKenzie. That's because McKenzie believes that the new game will out-perform last year's Modern Warfare 2, which broke launch day sales records before totaling over 20 million copies sold worldwide. Internal research at GameStop points to Black Ops performing even better. "I'm convinced it'll be the biggest launch that we've ever had, that the industry has ever seen," McKenzie said. "You look at the history of Call of Duty and they've had the dual studios for so many years that this is not out of sequence," said McKenzie. "I think that if that cycle was broken then I'd have a little more hesitation. But, again, everything is in line. "Each one of these [titles], they get so much bigger that you kind of look at it ... thinking each one can't be bigger than the prior year," he said. "But really, for over 12 weeks we've been tracking at a number that surpassed last year's." 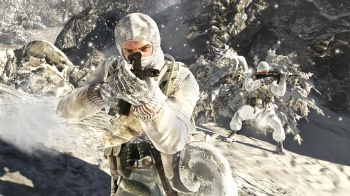 While I'm not certain that the buzz for Black Ops has been on par with Modern Warfare 2, I know that a lot of shooter fans were disappointed with EA's Medal of Honor. It's possible that gamers will flock to Black Ops looking for the kind of gameplay fix that they can't get anywhere else other the time-tested brand of Call of Duty. Who gives a crap if it's by Treyarch and not those other guys, right?